Indian Peaks Wilderness in Colorado, I have learned, is one of the great hiking venues of America, if not the world. I have hiked this Wilderness a number of times, and each time have my breath taken away by its astonishing beauty. This week, I am in Colorado to deliver a speech at the annual conference of the National Scenic Byways being held in Denver. A few of my good friends in Boulder offer to take me hiking the next day. I leap at the chance. The Lake Isabel Trail we select is modest in length. An impressive day hike. Being late in the summer season, we don’t come upon the startling proliferation of colorful wildflowers I’ve enjoyed on previous hikes at Indian Peaks, but enough remain to give us a visual treat. The trail is exceptionally well-maintained, and we see only a small handful of other hikers on our mid-week hike. The trail starts out in a pleasantly wooded section, and eventually opens up, above the tree line, to vast mountain vistas in all directions. Knowing that Indian Peaks is infamous for bringing sudden (and often quite cold or snowy) weather in the summer, I borrow a fleece jacket and wrap it around my waist. Sure enough, just after our lunch stop, we experience a mercifully brief spattering of cold rain. 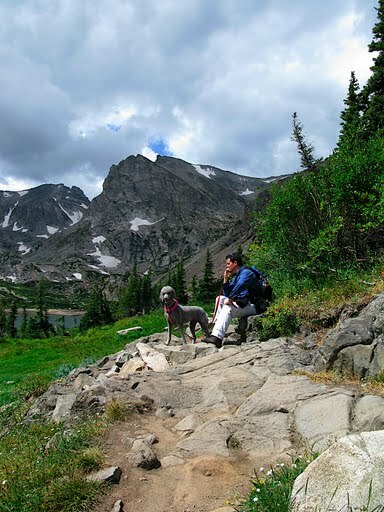 The lunch spot is the terminus of the trail, where the hiker finds the impressive Lake Isabel. Being fed by snowmelt from a steeply sloping bowl of mountains on three of its sides, the lake tends to be full of cold, dark blue water. Today, though, the lake water levels are down quite a bit – something I readily notice, as the normal water line is quite visible, and several feet above the current water line. Overall, this is a rewarding day hike only a short drive from Boulder.